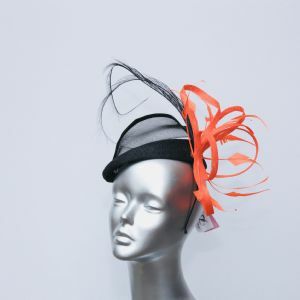 This beautifully structured women's fascinator in black, trimmed with bright orange, is the height of sophistication and perfect for a wedding or race day hat. The base sits on a very slim band for all-day comfort, and is perfectly trimmed with sinemay, feathers and loops to give interest. This gives height to a smaller lady and would complement a fabulous race-day outfit.